What is it really like to die? Though our understanding about the biology of dying is complex and incomplete, greater complexity and diversity can be found in the study of what human beings encounter socially, psychologically and spiritually during the experience. Contributors from disciplines as diverse as social and behavioural studies, medicine, demography, history, philosophy, art, literature, popular culture and religion examine the process of dying through the lens of both animal and human studies. Despite common fears to the contrary, dying is not simply an awful journey of illness and decline; cultural influences, social circumstances, personal choice and the search for meaning are all crucial in shaping personal experiences. 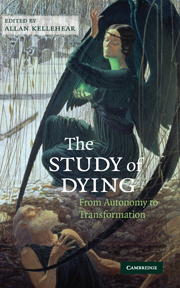 This intriguing volume will be of interest to clinicians, professionals, academics and students of death, dying and end-of-life care, and anyone curious about the human confrontation with mortality. Preface; 1. What the social and behavioural studies say about dying Allan Kellehear; 2. The dying animal: a perspective from veterinary medicine Siri K. Knudsen; 3. The dying human: a perspective from biomedicine Marie-Aurelie Bruno, Didier Ledoux and Steven Laureys; 4. The dying human: a perspective from palliative medicine Michael Ashby; 5. The demography of dying Glennys Howarth; 6. Historical approaches to dying Julie-Marie Strange; 7. Dying and philosophy Geoffrey Scarre; 8. The art of dying Clare Gittings; 9. Dying in Western literature John Skelton; 10. Cinematic visions of dying Fran McInerney; 11. Dying in Judaeo-Christian thought Douglas Davies; 12. Near-death experiences and deathbed visions Bruce Greyson.